Chocolate, Oreo cookies, Cream Cheese, Heavy Cream… I‘m making my shopping list and planning to make a special no bake dessert, that is delicious and looks great – No Bake Layered Chocolate Mini Cheesecake. We have a special occasion coming – my husband‘s birthday 🙂 . I usually make birthday cakes for my family, but this one is a bit different. 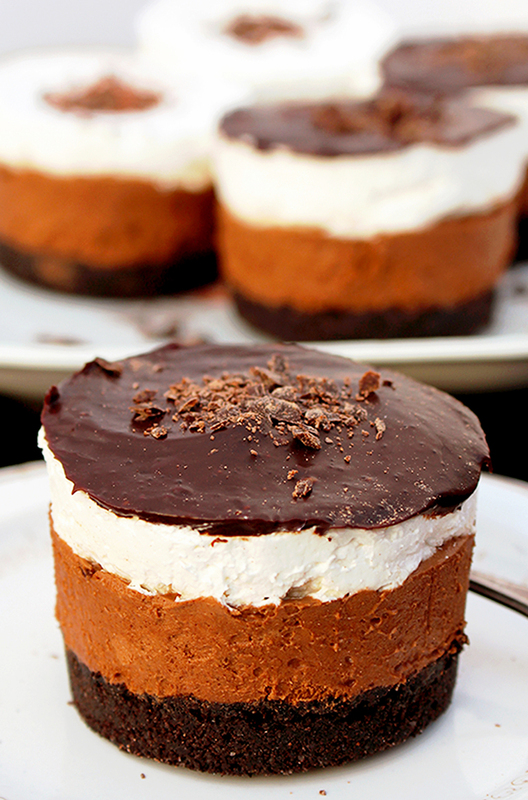 Since my husband is a big fan of Oreo cookies and he loves chocolate and light desserts, I‘m sure No Bake Layered Chocolate Mini Cheesecake will be perfect. I tried this dessert at my friend‘s and fell in love with it instantly. 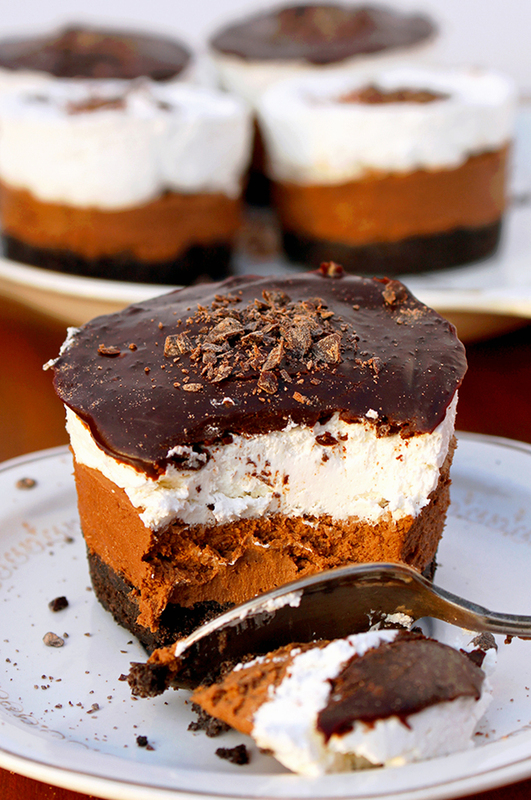 A dark brown, crunchy layer made of Oreo cookies, then brown chocolate cheesecake filling, white cheesecake filling and finally chocolate topping. So, after most popular cheesecake recipes on our blog – No Bake Strawberry Cheesecake and No Bake Chocolate Cheesecake Bars, I decides to make this decadent dessert which looks great and tastes even better. 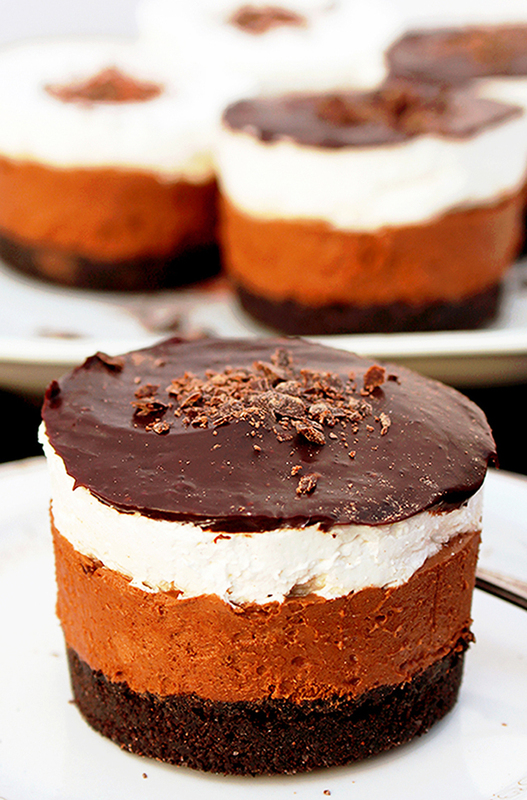 Perfect for holidays or special occasions – Layered Chocolate Mini Cheesecake. I‘m sure my husband will love my choice. I‘m making it with my son‘s help, of course. I don‘t have much time now, it has to be ready by the time my husband gets back from work. Luckily, it doesn’t take long to prepare it, but it needs to cool down in the fridge for a few hours. We can hardly wait to sing a birthday song and blow out the candles ♣. OREO CRUST - Prepare 12 paper baking cups. Put Oreo cookies in food processor and crumble them. Add melted butter and combine well. Put the mixture in the paper baking cups and press evenly, using a firm object, to get a solid layer. Leave in the fridge while you prepare cheesecake filling. CHEESECAKE FILLING - Melt chocolate and leave it to cool. In a large bowl, mix heavy cream using electric mixer at a medium speed, for 3 minutes, then add vanilla extract and mix for one more minute at maximum speed. In a separate bowl, mix cream cheese with powdered sugar with electric mixer for about a minute. Combine it well with heavy cream. Divide the mixture in two bowls and add melted chocolate into one and combine well. Take baking cups out of the fridge. Spread brown filling evenly over the Oreo layer, using spoon. Put white filling over the brown one and spread evenly. Leave it in the fridge for 4 hours. CHOCOLATE TOPPING - Put crumbled chocolate in a medium sized dish. When it melts, add sugar and heavy cream and mix well until the mixture is smooth. 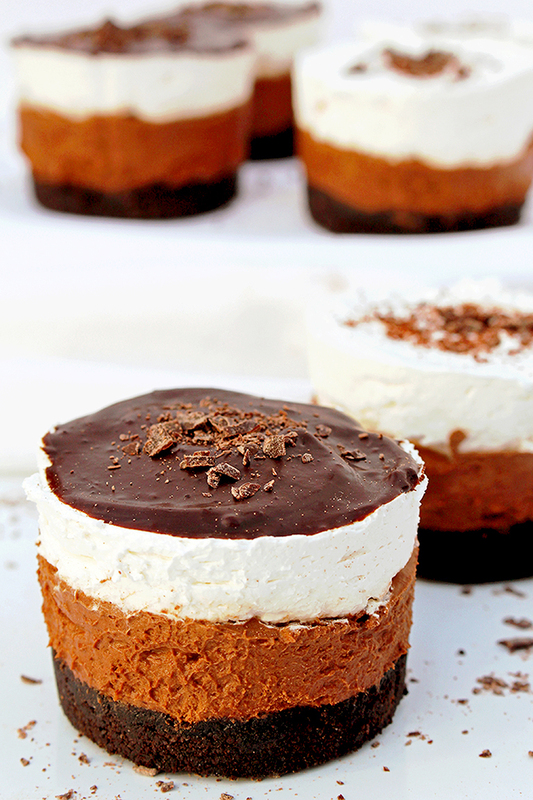 Take cheesecake cups out of the fridge and spread chocolate topping over each one of them. Decorate with chocolate sprinkles. Put back in the fridge for the chocolate to become solid. I’m wondering if these can be made in the mini cheesecake pans? They look awesome! Thanks a lot, Gail ? Yes, it could be made in Mini Cheesecake Pans. Oh my, these look delicious! I wonder if I added a bit of peanut butter or many just use the peanut butter oreos! Thanks a lot, Martha 🙂 We didn`t made on that way, but you can try with peanut butter oreos, if you like!